Posted April 8, 2019, 11:17 a.m.
Posted Aug. 30, 2017, 8:18 a.m.
Posted July 13, 2017, 7:38 a.m.
Posted May 15, 2017, 7:32 p.m.
Posted July 1, 2008, 12:08 a.m.
Nearly 16 years ago, Desirree Haro was standing in a Harbor City alley with friends when a car drove by, spraying bullets. The 15-year-old was the only one hit and died later at a hospital. At first, her mother, Teresa Haro, phoned investigators once a week seeking answers about who killed her daughter. Over and over again they told her they were working on it. A reward was offered. Years passed. Eventually, Haro stopped calling. Now, she’s hoping a new billboard and bus shelter campaign might spark fresh clues, or inspire someone with a guilty conscience to come forward. 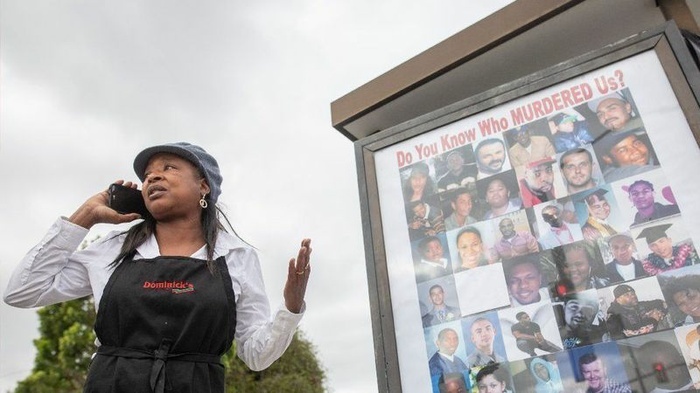 Posters featuring photographs of 48 homicide victims whose cases have gone unsolved have been placed at 10 bus shelters across Los Angeles County, from West and East L.A., to Arcadia in the San Gabriel Valley. In red, the posters ask “Do you know who MURDERED us?” The posters include contact information for several nonprofit victim’s rights organizations. In addition, electronic billboards displaying the photos went up on the 91 Freeway and near the 710 Freeway. The victims on the billboards will change every four weeks. The ad space was donated by Clear Channel, which works with community nonprofits on different campaigns. LaWanda Hawkins, an activist and founder of Justice for Murdered Children, is spearheading the effort. For years, Hawkins has focused on bringing attention to unsolved homicides. The homicide rate has been declining for decades. In 2000, more than 1,000 people were killed in L.A. County. Last year, 636 people were killed, according to a data analysis by The Times. Hawkins said she believes that just because fewer people are being killed in L.A. County doesn’t mean the public should stop hearing about the tragic losses that many families endure. Hawkins, whose 19-year-old son was slain in December 1995, hopes that the people who know something about the killings may have grown up. Maybe they’ve become parents themselves. “It’s our kids,” she said. “It’s not like the kids came from Mars. These are our kids. ”Los Angeles police said detectives exhaust every lead in such cases but welcome any assistance. "We don't want anyone to be forgotten," said Capt. Billy Brockway, who heads the LAPD’s South Bureau homicide division. "If there's something that aids us in the ability to do so, we're all for it." In 2008, Tyce Riddle, 19, was fatally shot in an apartment in Lomita, said his mother, Jennifer Riddle. In the months after the slaying, Riddle said, she lived with the harsh reality that as more homicides occurred, her son’s case got pushed further and further down the pile. “It’s a hard pill to swallow, but I also understand,” she said. Tyce Riddle was an athletic teenager who played baseball, football, basketball and volleyball. Riddle had been hanging out with the wrong crowd, but he made a decision in the weeks before his killing to turn his life around. He wanted to join the military. “It means the world” to know that people like Hawkins make sure her son isn’t forgotten, Jennifer Riddle said. For Kristen Turman, nearly two years have passed since she collapsed in her living room after police told her that her 20-year-old son had been shot in Harbor City while riding his bicycle home. Anthony Iniguez left behind two sons, and Turman makes sure that the kids grow up hearing about their father. She shows them videos, and tells them about the things their father loved: football, basketball and family. “All we can do is hope and pray that these billboards will get people talking again,” she said. Haro met Hawkins shortly after her daughter was killed near West 253rd Street and Normandie Avenue. Desirree, known as “D.D.” was a “good girl” her mother said, one who still played with Barbies with her nieces and nephews. She liked the Spice Girls. Her mother forever remembers her as a teenager. “Her getting up from bed, getting ready for school and laying back down,” she said. Norma Perry said that what she misses most about her son, Mylen Williams, are the kisses he used to give her on her forehead. He would tell Perry, who suffers from diabetes, that she wouldn’t have to work much longer, because he would take care of her someday. Williams, 20, was found shot in the middle of a Compton street in May 2017. Williams, whose girlfriend was pregnant at the time, never got to meet his daughter. “She looks just like him,” Perry said. Perry hopes that someone will recognize her son’s face on the poster, and maybe it’ll get people talking again. Each time she calls the detective, he says they’re working on it. For now, Hawkins will continue reaching out to family members who want their loved one’s photo featured.